On July 31, I was 345 pounds, and this morning I am down to 308. In spite of the three out front, I must say, seeing a zero in the tens place makes me really giddy. (I'm also really excited about my dropping BMI. When I started, it was 55.7, and now it's 49.7 - still a long way to go, but I'm out of the 50s!) This means my next short-term goal is only a pound away, and getting rid of that three forever should happen within the next two or three weeks! I know saying "I'm so happy I weigh 299 pounds!" isn't most people's dream, but after being so close to 350, this is a huge accomplishment. It's not quite the success of "onederland," but it's still a major personal triumph. So I've been trying to think of a 200's equivalent of "onederland" - any ideas? In lieu of my usual Roses and Thorns, I'd like to share with you all a fancy award I got yesterday from MackIam. Thanks so much! 1. I am the oldest of four kids - I have a sister (Lisa) two years younger than me, a sister (Katie) two years younger than Lisa, and a brother (Dan) ten years younger than Katie. The science of birth order is fascinating, and I am very much a firstborn. 2. 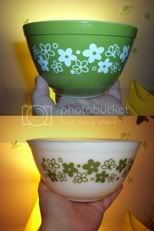 I'm in love with vintage Pyrex - when I first moved into my apartment, I didn't have any household things, so I started shopping around at thrift stores, and I found a few matching pieces from the 1970s. So cute! 3. I taught myself how to ready when I was three. I would always ask my mom what signs said, and eventually I pieced it all together and could read on my own. By kindergarten, I could read at an eighth grade reading level. I used to be "gifted and talented." Until about eighth grade. Then my focus shifted more towards ... well, boys. 5. Given the choice, I will always pick pearls over diamonds. I'm more a fan of subtle over sparkly. Plus, I have curly auburn hair and I think pearls compliment me the best. My parents got me a Mikimoto pearl necklace when I finished my Master's degree, and I can't wait to wear it somewhere really fancy! 6. I bought candy for my students since I gave them all exams this week, and yesterday I decided to eat a mini Twix bar. What a waste of eighty calories! It wasn't satisfying the way it used to be - when I would eat dozens and not think twice. Now that I sit back and really taste it, I can tell how artificial and not-truly-delicious it is. It's just not what I want anymore, and that's amazing to me. 7. 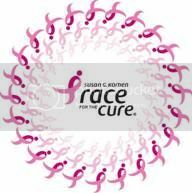 Tomorrow I'm walking a 5k for the Chicagoland Race for the Cure with a few friends, and I'm very excited for that! By next year, I want to run. But for now, I'm just glad to get out there and move! Nominate 15 newly discovered blogs. Yikes ... that's an awful lot for a Friday morning. I will do some searching this weekend and hopefully by my DDGbD post on Sunday, I will have some! Wow congratulations! That's such a huge accomplish that you should be truly proud of. You're losing it so fast, which is probably your bodies way of telling you... THANK YOU! I'm sure you feel absolutely amazing! I'm not sure of a good word for the twos... it's way too early to be creative! WOW you are doing great!!!! I can't wait for you to get to your next goal. You can totally do it! I am with you on the sweet thing. Well I'm finding most of the foods I used to just "LOVE" don't give me the same satisfaction as they used to. Which is good, because they no longer have a hold on me. Now I get excited for a really crisp apple or a fresh tomato... Watermelon.....Oh I love it!!! Whew! I'm back now. I used to feel that way about sweets. I had some M&M's the other day, I used to love them, now they taste funny. I just don't get what I loved about them. OK I'm done now! Have a wonderful successful day!!! Soon you will be in Twoterville!! And I love love love pearls... my favorite, too. I think being excited about being at 299 pounds is PERFECT. You aren't everyone else and your struggles are different. You've come along way and you're doing it beautifully! Great job! I totally agree with foods not being like they used to be! Things that I used to crave are things that I wouldn't touch with a 10 foot pole these days! Makes me realize I was eating to eat. Have a great weekend and good luck at that race! Remember to get a good night's sleep, and stretch before and after to avoid muscle strain! Good race for a great cause! Congrats on the weight loss and good luck with your walk. I walked in that same walk here in Mississippi this year and I was fun.